The Association of Maine Archives & Museums publishes a quarterly print newsletter in February, May, August, and November. We encourage members to submit news about their organization and other items of interest to the field. See the Newsletter Archive to review past issues (members-only; must log in first). See the Newsletter Advertising page for specifications on ads. Also submit your news to the news blog, event listings, or jobs/internships board on this website! All submissions should be sent as separate email attachments, preferably in Microsoft Word format. Please send images as separate jpg attachments. See photo guidelines below. Please email submissions to Newsletter Editor, Lorraine DeLaney at ldelaney@colby.edu and put “for MAM newsletter” in the subject line. We look forward to receiving your submissions! REMEMBER: You must be an up-to-date member of MAM to submit material to the newsletter! Need to renew? Do it now, online: click here. Not sure of your membership status or having trouble renewing? Email info@mainemuseums.org. Feature articles should be 500-1,500 words in length, accompanied by at least one photo (see photo guidelines below). Please be in touch at ldelaney@colby.edu well in advance of the deadline to discuss topics for potential feature articles. Dispatches are 50-150-word blurbs about awards, grants, staff news, conservation projects, special community collaborations, etc. We welcome one photo for each blurb (see photo guidelines below). 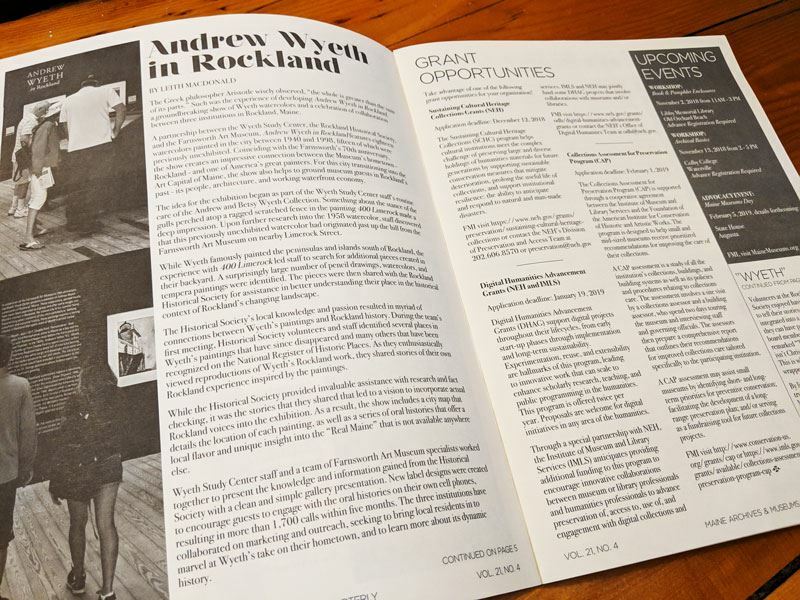 Opportunities are 50-150-word blurbs about job listings, workshops, conferences, grant opportunities, traveling exhibitions, etc. We welcome suggestions about things to include in this section, even if it doesn't have anything to do with your institution! The Seen & Heard section of the newsletter is for photos of recent goings-on at your institution. Be sure to provide a one-sentence caption explaining who or what is pictured and when the photo was taken. See the photo guidelines below. Send photographs as a separate file. Do not embed photos in your text file. Photos should be 300 dpi JPGs or TIFFs. Be sure to include a caption for each photo in your email message.